Your subtle bodies are the various layers of vibrating energy that make up the human energy system. Along with your chakra system, your subtle bodies and other subtle energy points create an inter-connected field of energy around the physical body that is commonly known as the auric field. 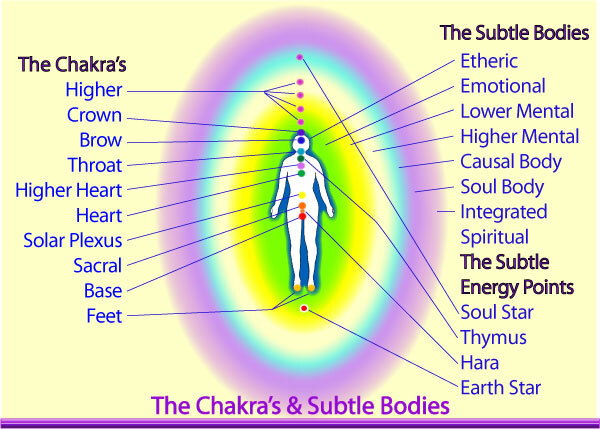 Each of your subtle bodies connects into the physical body via an energy point or chakra, which directs the energy into your physical body via the meridian system. Here we are going to focus particularly on your subtle bodies and subtle energy points - you can find out more about your Chakra system here. As you move outwards from your physical body into your auric field, each subtle body vibrates at a slightly faster vibration than the one before it. So the etheric body is faster than the physical and the emotional body is faster than the etheric body etc. Each of these different layers of energy, including the one we recognise as the physical body inter-penetrates the others to work as a complete system. Everything that exists in the physical plane has its own subtle etheric body counterpart. The human etheric body is the vibrating web of energy from which our energetic blueprint is created. Vibrating at a slightly higher frequency than the physical plane it is normally unseen but non the less important for our well-being. Its strength & vitality can be undermined by shock, trauma & drug use as well as unresolved issues filtering down to it from other subtle bodies. The etheric body is linked to the base chakra. The emotional memories and patterns that are stored in our emotional body trigger our emotional responses to the events in our lives. The emotional body is the layer of energy beyond the etheric body and is unique to each individual. It contains all our emotions and feelings including those created by unresolved issues from other life times. The emotional memories and patterns that are stored in our emotional body trigger our emotional responses to the events in our lives. The emotional body functions outside of third dimensional reality and so has no recognition of time. This is why sometimes a person’s emotional reaction to a particular situation can seem completely out of proportion to what is currently happening in their lives. The trigger in fact comes from a previous unresolved trauma. These emotional responses are brought into incarnation via the soul and mental bodies for resolution. The emotional body is linked to the sacral chakra. Emotional energy is very powerful as it this that gives power to our thoughts and intentions. The lower mental body receives, stores and transmits all our thought patterns and mental processes. It is linked to the solar plexus chakra. Thoughts extend beyond the mental body as energy and create our realities so it is important to choose the thoughts that we allow to dwell in our minds. When we link thought with the power of emotions we become creators so it is important to monitor that which we are choosing whether consciously or unconsciously. The higher mental body is the layer of energy linked to the heart chakra and is therefore the bridge from the physical to the spiritual realms. When we maintain an open heart chakra we receive light, information and inspiration from our soul through the higher mental body. This layer of energy acts as a filter for past life information and karmic patterns to come into consciousness. The causal body is the layer of energy beyond the higher mental body and is linked to the throat chakra and the causal chakra at the back of the head. This is the doorway to higher consciousness and links the personality to the collective consciousness of the planet. The causal body can be seen energetically as seven concentric circles of rainbow light which contain everything that is real and permanent about us. These shimmering spheres of light reflect the unique spiritual attainments of the soul. Gifts and talents that you have attained in previous lives are sealed into your causal body and made available to you through your soul when you are ready to use them. At this level there is a merger of all aspects of all the subtle bodies as well as the essence of the physical. So this body contains all the integrated spiritual principles that an individual may work with. Linked to the Crown chakra. This subtle energy point is about 9” below the feet in a direct line with the base chakra and hara point. The earth star is an important energy centre because it is our alignment point with the earth’s magnetic grid and ensures that we are able to effectively ground and focus energy. Being properly grounded through the earth star is essential for us to fully connect with our multi-dimensional selves, the ascended realms and other star systems. The Hara is a subtle energy centre situated in the auric field just below the navel. It is not the same as the sacral chakra. When the hara point is working properly it brings forward an awareness of the need to follow divine will, promoting a sense of true purpose & fulfilment as well as a greater sense of being centred in the physical body. It resonates with the spleen chakra. An important subtle energy point that stimulates the development of unconditional love and compassion. The ancient spiritually attuned civilizations all had this energy point fully functioning and recognised its true purpose as the ‘Higher Heart’ centre or chakra point. A message to us of the importance of this centre in our unfolding spiritual development. 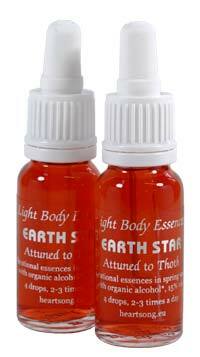 This subtle energy point is situated above the crown chakra and higher chakras. When activated it is aligned with the soul, all 'higher' energies, star systems and the universe, allowing a greater amount of soul energy, light, guidance and healing to filter through to the personality.